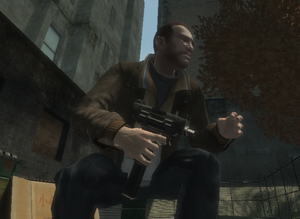 Niko Bellic firing a Micro-Uzi in Grand Theft Auto IV. 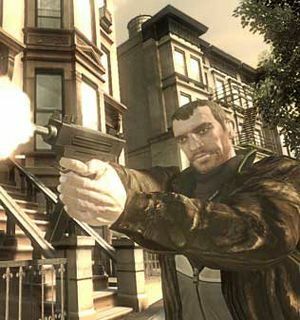 Niko Bellic wielding a Micro-Uzi in Grand Theft Auto IV. The Micro Uzi is a sub-machine gun available in Grand Theft Auto III, Grand Theft Auto: San Andreas, Grand Theft Auto Advance, Grand Theft Auto IV and Grand Theft Auto: Chinatown Wars. It is known as simply Uzi in GTA III and Advance although it is named Micro SMG in all other GTAs that have it. In the GTA III rendition, the Micro Uzi holds a 25 rounds per magazine but in GTA San Andreas, GTA IV and GTA Chinatown Wars it holds 50 rounds instead. It's the only gun in GTA III available for use in a vehicle and one of the few on the later games. The GTA III version of the weapon features an orange tip on the muzzle, a feature usually reserved for toy weapons. This might imply that Claude may have disguised the weapon, that Ammu-Nation paint the muzzles of its Micro Uzis before selling them, or that the weapon has been converted out of a toy. Since real life criminals often disguise their weapons by painting the muzzle orange, the former explanation might be the legitimate one. In GTA: San Andreas the model has two magazines taped together for easier reloads and resembles the look of a Micro Uzi but called Micro SMG in game. The Micro Uzi shares the same skill slot as the Tec-9. When Hitman skill level is reached, it can be dual wielded, doubling the player's round count to 100. In GTA III, it is a weapon of choice for the Yakuza, Southside Hoods and Colombian Cartel. This sub-machine gun is more commonly used by the Ballas, Varrios Los Aztecas and Da Nang Boys gang members in GTA San Andreas. In GTA San Andreas, it has a rapid rate of fire. In Grand Theft Auto IV, the Micro Uzi is called the Micro SMG just like in San Andreas. It can be identified as the pistol version because the side-folding wire stock is deleted, and there is no provision on the rear of the receiver to mount one. One can only assume that the pistol was illegally modified for full-automatic operation. It has a 50 round magazine capacity, which is incorrect because its magazine has the dimensions of a 32 round magazine. The weapon has a very limited range, about equal to the pistol, and will kill multiplayer enemies with about 5 headshots or 10-15 bodyshots. It is probably the weakest weapon in the game, and is only used because of its incredible rate of fire, which makes it the best weapon available for drive-bys. Harwood, Portland - At the corner of the concrete embankment just northeast of the car crusher at the Harwood Autocrusher and Junkyard. Saint Mark's, Portland - In one of the backyards running along an alleyway. From Momma's Restaurante, go south to the next block and turn left into the alley right next to a shop with a green awning. Once inside the alley, head east then turn left at the third opening (near the police bribe). Turn east and you will see the weapon next to a hidden package. Red Light District, Portland - Available to buy from Ammu-Nation after completion of Cipriani's Chauffeur ($800). Trenton, Portland - On top of Liberty City Sawmills (near the large teal rooftop on the west side) next to the body armor icon. Use the very low wall near the bus station. Walk on the low wall and jump over the sawmill wall. Then go over to the large mound of sawdust to gain access to the rooftop. Newport, Staunton Island - Available to buy from Ammu-Nation after completion of Last Requests ($800). Ganton, Los Santos - Underneath the bridge that connects Ganton and East Los Santos. East Beach, Los Santos - On top of a building along the crooked uphill road that leads to East Los Santos and Los Flores. Angel Pine, Whetstone - Behind a trailer in the trailer park. Esplanade North, San Fierro - In Pier 69, behind the building where a Well Stacked Pizza store is located. Verdant Meadows, Bone County - Inside a destroyed plane, in one of the cylindrical parts. Redsands West, Las Venturas - Between a trash can and a house near the Redsands West Safehouse. Available to buy from Ammu-Nation after the completion of Doberman. The Micro-SMG can be purchased from the back-alley gun shops after the mission Do You Have Protection? for $1,200 and each additional magazine costs $100. It can be purchased from Little Jacob for $840 and each additional magazine will cost $20. The Uzi has minimal range and poor stopping power, but it has an extremely fast rate of fire and a 50 round magazine, making it the best weapon in the game for drive-bys or car chases because you can just spray without having to reload. Beechwood City, Broker - Can be found in the alley behind the Homebrew Café on Dillon St.
Francis International Airport, Dukes - Can be found under the Broker-Dukes Expressway, coming from Beechwood City. Steinway, Dukes - Can be found on the third floor of an unfinished building on Concord Ave. Overlooking Steinway Park. Charge Island - Can be found on the left side of the pier behind the boat dock on the northwest side of the island. The player can pick it up during the mission Catch the Wave if they want. Star Junction, Algonquin - Can be found on the edge of a large planter behind the Majestic Hotel. The Exchange, Algonquin - Can be found in an alley between Bismarck Ave and Albany Ave near the Goldberg, Ligner and Shyster building. Happiness Island - Can be found within the guard booth on the western pier. The player crashes onto this pier with the Annihilator in the mission Out of Commission. Booth Tunnel - Can be found in the third cross-tunnel, nearest Alderney. Westdyke, Alderney - Can be found behind a Cluckin' Bell billboard off Beaverhead Ave.
Alderney City - Can be found on top of a Liberty State Delivery tractor trailer in a truck lot on the west side of the Plumbers Skyway. The Micro Uzi in GTA III. The Micro Uzi in Grand Theft Auto: San Andreas. Note the two magazines taped together for faster reload. The Uzi in Grand Theft Auto IV. Micro Uzi HUD in GTA III. The Micro Uzi HUD icon in GTA San Andreas, closely resembling a Mac-10. Coincidentally, Uzis are commonly confused with MAC-10s due to their similar design. The Uz-I HUD icon in GTA Advance, also more similar to MAC-10 than the Uzi. The Micro SMG HUD-icon in GTA IV. The Micro Uzi in real life. Gold SMG, a gold plated version of the full-size Uzi featured in The Ballad of Gay Tony. * = The Lost and Damned only. ** = The Ballad of Gay Tony only. *** = TLAD and TBOGT only. This page was last modified on 7 July 2014, at 18:46.